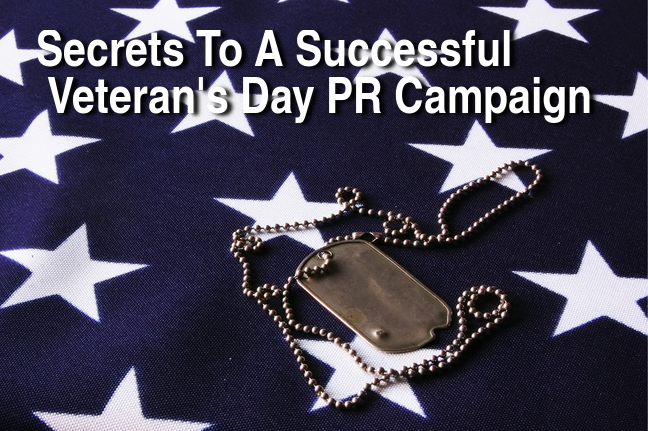 As a public relations opportunity, Veterans Day offers a legitimate news hook, yet a campaign or pitch built around the occasion can be tricky. Certainly, it’s not to be confused with last week’s “National Cat Day” or the upcoming “National Square Dance Day” — celebrations that beg for B2B and B2C PR teams to newsjack them with crazy, creative pitches. Veterans Day, by contrast, demands a serious and thoughtful campaign. If you’re building a corporate social responsibility program around our nation’s observance of the day, it had better strike the right tone. Do a deep dive on what’s already out there. The last thing any good PR professional wants to do for a Veterans Day effort is to copy something already in the works. Obviously there is room for more than one “buy x and we’ll donate to y” but an original idea will be more successful. It’s often helpful to scan newswire releases from previous years to determine levels of commitment and PR strategy. Partner with a reputable organization. For so many reasons: to vet a concept for appropriate theme and messaging, to lend a campaign credibility and for “boots on the ground” in staging an event or other massive undertaking. We conducted an effort for an e-commerce site with Iraq and Afghanistan Veterans of America, a wonderful organization with deep resources, PR savvy, and refreshing honesty when it came to brainstorming ideas that would work to benefit all parties. Avoid campaigns that pander or pity. Every year there’s an editorial advising us to stop either putting vets on a pedestal, or pitying them. It’s true that many veterans have a hard time readjusting to civilian life. And we should recognize servicemen and women for their sacrifice, but the tone is important. The best campaigns are positive; it can even be lighthearted as long as its “heart” is in the right place. This underscores the value of setting up a partnership with a credible organization. Choose an early start date…and start earlier than that. This is a very competitive time period with many vying to “own” not just Veterans Day, but the start of the holiday season as well. A smart start will include communications as early as September, but at least by Columbus Day. Choose a cause that aligns with the company mission. Sure, it’s great to offer veterans free meals or train tickets, etc. but a greater impact can be achieved with a more strategic, long-lasting effort. Two campaigns gaining traction last year were devoted to providing jobs. Starbucks and Uber, huge employers already, made ongoing commitments to hire veteran workers and Starbucks is more than a third of the way to its goal, which is a true win-win. Secure a fitting spokesperson. Seems obvious, but sometimes companies choose sizzle over substance, and it doesn’t always work out. If the budget only allows a celebrity spokesperson to do one broadcast appearance, will it really be worthwhile? Is a boldfaced name even right for the cause? Might a hands-on VA expert or, of course, someone who served, be the best person for the job? Make a lasting impression. Assuming there are clear goals for the campaign, they don’t need to end the day after the holiday. It’s a better idea to revisit the partner organization to determine the campaign impact and make future plans. If sales (and therefore donations) increased, that may be a trade or business story, of course. Even better is a testimonial from someone positively touched by the campaign. A single example is more powerful than a hundred press releases.